CHARLESTON, Mo. - A Missouri man who was sent to prison 13 years after his robbery conviction due to a clerical error was set free by a judge Monday, reports CBS affiliate KFVS. Cornealious "Mike" Anderson, of St. Louis County, was convicted of robbery in 2000 and sentenced to 13 years but was never told when and where to report to prison. He spent the next 13 years turning his life around - getting married, raising three kids, learning a trade. He made no effort to conceal his identity or whereabouts. Anderson paid taxes and traffic tickets, renewed his driver's license and registered his businesses. Not until last July did the Missouri Department of Corrections discover the clerical error that kept him free and authorities went to his home and arrested him. "They sent a SWAT team to his house," Anderson's attorney, Patrick Megaro, told the Associated Press in April. "He was getting his 3-year-old daughter breakfast, and these men with automatic weapons bang on his door." He has been imprisoned in the Southeast Correctional Center in Charleston, Mo. ever since. But on Monday, the 37-year-old Anderson appeared in court to fight for his freedom and Mississippi County Associate Circuit Judge Terry Lynn Brown ruled that keeping Anderson in prison would serve no purpose, reports KFVS. Judge Brown said that rather than Anderson being granted parole, he would get credit for the 4,794 days between when he was convicted and when he was arrested last year. The judge also lauded Anderson's "exemplary" behavior during his 13 years of freedom. "You've been a good father. You've been a good husband. You've been a good taxpaying citizen of the state of Missouri. That leads me to believe that you are a good and a changed man," he said. "You're a free man," Brown continued, telling Anderson to go back to his family. CBS affiliate KMOV reports Anderson then went and embraced his wife and daughter in the courtroom. According to KFVS, Anderson's family erupted in tears. His wife reportedly said she is jumping for joy. 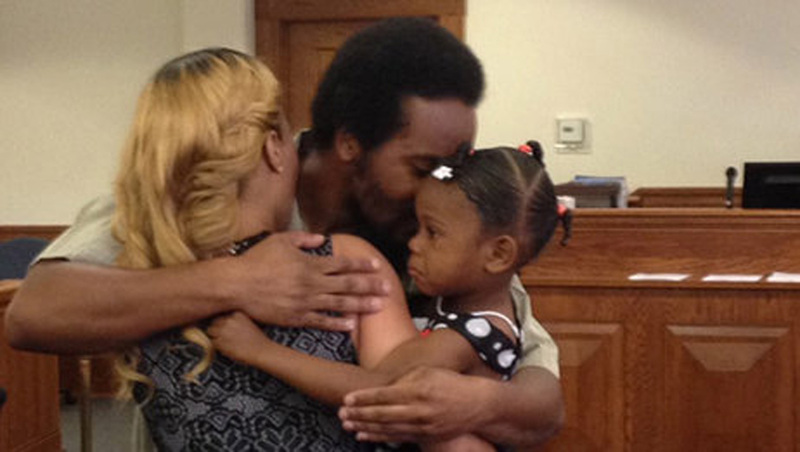 Anderson walked out of the courtroom with his wife and 3-year-old daughter on one arm and his mom on the other. Before being driven away to a freedom celebration at an undisclosed spot, Anderson told reporters he was "very happy. My faith has always been in God. I'm just so thankful. Thank God for everything." Anderson had one arrest for marijuana possession on his record when he and a cousin robbed an assistant manager of a St. Charles Burger King restaurant on Aug. 15, 1999. The men, wearing masks, showed a BB gun and demanded money that was about to be placed in a deposit box. When Anderson was never told to report to prison after his conviction, his attorney reportedly told him to just wait. "A year goes by, two years, five years, 10 years. He's thinking, `I guess they don't care about me anymore,'" Megaro previously told the Associated Press. So Anderson went about his life, never trying to conceal his whereabouts or identity. He married, divorced, married again. He raised three children of his own and a stepchild, and owned and operated three construction businesses. He coached his son's youth football team, and he ran the video operation at his church. Anderson's plight drew international headlines last month. An online petition on change.org includes more than 35,000 signatures urging the state to set him free. Even Attorney General Chris Koster seemed inclined to find a solution to resolve what he called a "difficult situation." Peter Joy, director of the Criminal Justice Clinic at the Washington University School of Law in St. Louis, previously told the Associated Press it isn't unusual in a country with such a high prison population for sentences to fall through the cracks. What is unusual, Joy said, is for it to go unnoticed for so long.